A college student makes a friend and then, over the years, learns about friendship's duty in matters of mental retardation, the horrors of Mansfield Training School, and the family secrets held by an impersonal beaurocracy. When she met him at Trinity College, everything about Jimmy Lundquist seemed exaggerated and askew, from his wild hair and polyester shirts to his affinity for college parties and the darker side of the neighborhood. But what mattered most was he didn't care how she fit into the social scene, or whom she was with; all that counted was how she treated him. I met Jimmy Lundquist more than half my lifetime ago, on the first day of my freshman year at Trinity College. Then, as now, I was captivated first by his grin. It filled his angular face, squeezing his eyes into upside-down crescents and stretching, it seemed, from one long ear to the other, from the tip of his pointed chin to his balding crown. At the time, he had no teeth, which accentuated the effect and made him spit as he spoke. Wild curls of dark hair ringed his head, making him always seem slightly askew. In fact, everything about Jimmy seemed crooked, exaggerated and in motion. He walked with a pronounced limp, and his right arm jutted out to the side, the elbow bent and the hand, useless, curled at an unnatural angle. Jimmy lived a few blocks away, in a group home on Wilson Street run by the state Department of Mental Retardation, and he spent a lot of time roaming the neighborhood. He filled us in on the seamier sides of life—where the drug deals went down, where the prostitutes (several of whom he had befriended) worked their trade, and which local characters were bad news. Jimmy had met my resident advisor, Ben Thompson, along Vernon Street, and it was Ben who introduced him at our first dorm meeting. Wherever I went on campus, Jimmy seemed to be there; I assumed he had been a part of Trinity forever. That winter he got a job in the cafeteria, clearing and wiping down tables and setting up for functions. When he wasn’t in the dining hall, he visited friends, went to frat parties, or hung out on the quad or Vernon Street, which occasionally got him into trouble. Some students complained to administrators about his presence on campus. Others entertained themselves by getting him drunk. Once, he got into a fight after someone threw an egg at him. Several times, Ben stepped in to work out problems. Unlike me, Jimmy was a master at social connection. He seemed to know everyone and was forever hailing me from across the quad: “Hey, Charlotte! Got someone I want you to meet!” More than anyone, it was Jimmy who welcomed me into the community and made me feel I belonged. As I struggled to decipher the social groupings, the frat affiliations, the unspoken codes of dress and behavior, he was one true thing. Jimmy didn’t care where I was from or whom I was with; all that mattered was how I treated him. And he became my refuge: the person who kept me true to myself. But I didn’t understand any of that then, just as I didn’t understand so many things about Jimmy—about how far he had come from a painful childhood in a state institution, and how he would continue to grow as he built a life on his own. I might never have begun to unfold the pieces at all if the changes in both our lives hadn’t prompted me to set down his story. 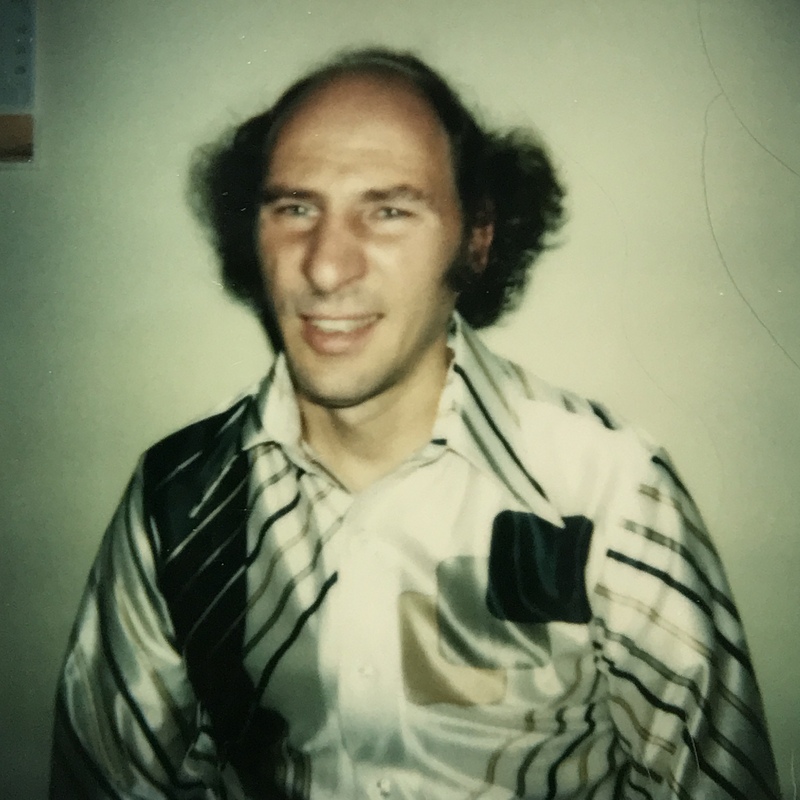 ABOUT A YEAR AFTER I met him, Jimmy and Mary Tarquinio, a resident in his group home, got their own apartment on Zion Street, abutting the Trinity campus. Cheerful and easygoing, Mary is a natural counterpoint to Jimmy’s intensity. He’s easily agitated; she’s hard to ruffle. He talks constantly; she listens and laughs. She even balances him out physically. Where he is a wiry bundle of sharp angles, she is a softly contained square, tiny and plump. Mary is the one person who can tell Jimmy to knock it off when his ramblings and repetitions get to be too much. She also could read, write and cook—skills Jimmy lacked and desperately needed to live on his own. At 59, she was 20 years his senior, but somehow, that never seemed to matter. He clearly adored her, and in time it transformed him. By this time, Ben had graduated, and Jimmy was seeking me out more and more. He, Mary and I visited, went to movies at Trinity’s Cinestudio and hung out on the quad. Then, as now, Jimmy delighted in harvesting nuggets of news and gossip—the more privileged the better—and got a kick out of playing off his mental handicap. “I’m pretty smart, kid,” he’d say, holding up his good hand for a high five. “I keep tellin’ you I’m retarded. I just want people to think I am. I don’t think so!” He’s always had a bagful of favorite phrases and a tendency to end his sentences with a question—“I’m wrong?” “That true?”—to which he expects an answer. As a small child, Jimmy told me often, he put sand in his grandfather’s gas tank. As a teenager, he convinced his brother to steal his grandparents’ car and drive them both to New York City with a couple of girls. His real father, whom he rarely saw, wore fancy duds but made his sons do without, so Jimmy stole $500 from his coat pocket in revenge and spent it with his brother on clothing and beer. He raged against his mother, who committed him to a state institution, and talked affectionately about her parents, with whom he stayed on visits home. His stories speak of a wildness and anger I rarely glimpsed. In the spring of 1979, Jimmy and Mary decided to get married and surprised me by asking me to be maid of honor. I feared I wouldn’t be able to make it back from a summer job out of state, so I turned them down. Ben and other Trinity friends attended and watched Mary take her place beside her niece instead; Jimmy’s cousin served as best man in the Meriden church his grandparents attended. The reception was held downstairs, with Jimmy’s aunt arranging for flowers (all silk), food (prepared by her friends) and music (a record player, Ben recalls). For their honeymoon, they visited another of Jimmy’s aunts in California, the only time either of them has been on a plane. Junior year, I returned to campus with a beat-up 1954 Ford, which Mary adored, and began chauffeuring them to the grocery store, taking them on picnics and helping them run errands. When my parents visited, we all went out together. At the end of that school year, Jimmy insisted on treating me to a thank-you dinner at the downtown restaurant where Mary was working as a laundress. Jimmy knew the streets of Hartford well, but on the way back he sent me on a circuitous route full of wrong turns. When we returned to my dorm, I found the delay had been intentional: He had a small surprise party waiting for me. With Mary’s encouragement, Jimmy was starting to settle down. In future years, she would convince him to stop drinking, stop going to bars, and eventually, to stop going out at night altogether. After I graduated and left Hartford in 1981, I came back to visit. While I was there Jimmy met up with Ben at Trinity’s homecoming football game. Hearing that Ben and his longtime girlfriend had split up, Jimmy encouraged him to write me a note. Jimmy, Mary and I were walking the paths of Trinity this past fall when he told me this story. I still have the note, but never knew its impetus. Jimmy giggled delightedly, relishing his role of matchmaker. “See, I smart!” he exclaimed, his body alive with excitement. “I told Ben write that note.” By the time I returned to my new home on the West Coast, we were a couple. I moved back East to be with Ben the following summer, and that fall we invited Jimmy and Mary for a visit. They took the bus up from Hartford and spent the night on a pull-out sofa in our tiny apartment. It was on that visit that Ben discovered I had never told Jimmy and Mary about my older brother Henry, who also is mildly retarded; he wanted to know why. The short answer is, it just never came up. The truth, perhaps, is something deeper. Though I knew Henry and Jimmy and Mary all belonged to the same “class” of people, I had grown up with Henry as a playmate and friend and saw him foremost as an individual. I naturally saw Jimmy and Mary the same way. But on that same visit, I noticed my perception had shifted. A few months earlier, I had taken a job in a community residence for the developmentally delayed, and that weekend I heard myself treating Jimmy in a way I never had before. I was short-tempered and intolerant. He was now work to me, and he was invading my space, intruding on my day off. Ben was holding down a stressful job in a mental health crisis clinic and found the weekend just as difficult. On Sunday, we put Jimmy and Mary on the bus home and didn’t invite them up again. Still, we kept in touch. They never missed a chance to send a holiday or birthday card; we called on special occasions and a few times visited them in Hartford. We invited them to our wedding in New Hampshire, but they declined, having no way to get there. I told Jimmy recently that I wished I’d made arrangements for them to attend. “Little bit too late now,” he said, without malice. The cards continued to arrive in our mailbox, though more often, we forgot to return the favor. Occasionally, Jimmy called for advice or emotional support when problems arose; but with two children, we were turning increasingly inward. Jimmy and Mary were slipping into our past. It might have continued like that if not for the way our lives shifted a year ago. For me, it began with a quiet questioning, a nagging feeling something was missing. Prompted by the turning points of my 40th birthday and the departure of my younger child for kindergarten, I made a list of the things I found most meaningful and was surprised to find my friendship with Jimmy and Mary held a place of honor. We called and invited them for a day’s visit. We went apple picking, and Jimmy brought gifts for the kids—baseball caps someone had given him and a bag of candy. A couple of months later, as we sat around the living room celebrating New Year’s Eve with close friends, Ben spontaneously put in a call to Jimmy, and in a moment, everything changed. Mary was in the hospital, on life support. Two days before Christmas, she had fallen and struck her head on a rocking chair. Jimmy had called an ambulance, and when the doctor at Hartford Hospital detected her failing balance, he had admitted her immediately. Over the next several days, she had deteriorated quickly, losing the ability to walk, to eat, to speak and ultimately, to breathe on her own. She was diagnosed with Guillain-Barré Syndrome. Our medical encyclopedia told us three-quarters of all victims ultimately recover, though it can take a year or more. At 79, diabetic and legally blind from macular degeneration, Mary was not necessarily a promising patient. I drove down to visit every few days in those first weeks. Gradually, Mary began to improve. By the second week, she was moving her hands, arms and head. The feeding tube was moved to her stomach, and she began speaking again. 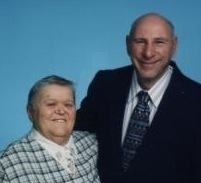 Jimmy spent hours at the hospital every day and was unrelenting in his efforts to get her the best care. At every visit, he and Mary spent time sitting quietly, holding hands and gazing at each other. Once in a while, I helped Jimmy with his mail or the instructions for a ready-to-eat meal, but he didn’t need me as much as I expected. Through the years, he had been networking feverishly, and he had friends everywhere, along with a host of formal supports, from his case manager at DMR to his counselor at the Institute of Living. I was amazed by his resourcefulness, and his ability to take care of Mary, as well as himself. Within a week of her diagnosis, he had begun researching rehabilitative therapy with a hospital social worker. He arranged for Mary’s transfer, in late January, to the hospital’s acute rehab center next door. By February she was able to sit up. On Valentine’s Day, I watched her stand for the first time and break down weeping. Three days later, she took a few steps with a walker, and three weeks later, after a lot of hard work, she astounded us all by returning home aided only by a cane. Jimmy and I spent a lot of time together during those long weeks, and as I listened, I heard him telling his story, in bits and pieces, as he has always done. Only now, it resonated differently. Behind the familiar anecdotes, I heard a longing to be recognized, and I realized that I had the tools to tell Jimmy’s story, to give him the voice to tell the world what he had been trying to tell each of us for so long: that his life matters, that all our lives matter. Jimmy and I were driving up Capitol Avenue on a bright, cold Thursday when I asked if I could do just that. For almost the first time since I’ve know him, he was at a loss for words. He smiled a huge, calm smile, and his eyes filled slightly. DAYS LATER, JIMMY was in high gear, turning up one contact after another from his past and present. Every time I spoke with him, it seemed, he had another name: people he saw every week, people he saw occasionally, and, in some cases, people he hadn’t seen for decades. One of them was Daniel O’Leary, whom Jimmy remembered fondly but hadn’t seen for 30 years. If I was surprised to find O’Leary, he was even more startled to hear from me. Our conversation seemed to break open a dam of memories, and once he started talking, he just couldn’t stop. It was he who gave me the clearest glimpse into Mansfield Training School, where Jimmy had lived for the first half of his life. O’Leary told me he was reprimanded for bringing children’s books into the younger dorm, reading to the boys and letting some of them climb in his lap. He told me about the isolation rooms, where residents were locked for days or weeks at a time for bad behavior, and about a boy who was beaten nearly to death with a baseball bat for dirtying an aide’s uniform during a game. He talked about kids who punched windows in frustration and doctors who stitched up their wounds without anesthesia; about the occasional sexual predators who worked on the wards; and about the black and Hispanic residents, who were treated worst of all. A few years later, O’Leary left the field, and he hadn’t been back to Mansfield since. “I don’t even like driving by it,” he told me. As it happened, I already had arranged through the University of Connecticut, which now owns much of the campus, to tour some of the vacant buildings the following week. I invited O’Leary along. As I prepared to leave on the day of the tour, he called to say he would be there. Jimmy was eager to return. Mansfield was the first place he wanted to take me. Following his plan for the day, he, Mary and I stopped first for lunch at a restaurant near the school, then headed into his history. Sprawled across the undulating hills of rural Mansfield, the campus is still dominated by the massive two- and three-story brick buildings constructed around the time of the school’s opening in 1917. They are beautiful, even in their decay, and it was hard for me to reconcile their graceful architecture, so familiar from my own days in gentler institutions, with what I knew was the severity of life inside. In Jimmy’s early years, the school’s residents—there were 1,200 in 1947—were known as inmates. They were divided by gender, age and behavior, with only the profoundly retarded, who could not feed or toilet themselves, kept entirely separate. AT THE END OF a long driveway, we pulled into a potholed parking lot beside Johnstone Hall, where Jimmy lived for nearly two decades. Dwarfed by an overgrown tangle of trees, vines and shrubs, it is one of the only vacant boys’ dorms. We were met at the door by a man with a key and O’Leary. A bear of a man, tall and round, with graying hair and pink Irish skin, O’Leary recognized Jimmy instantly and greeted him with a gentle handshake. Jimmy proudly introduced him to Mary. Jimmy had never passed through this doorway with anyone from outside Mansfield. In his childhood, the building was locked and barred, and families were never allowed inside. We stepped hesitantly over the threshold. Just a couple of aides watched over the entire group, he said, and if the volume in the room began to rise, one would walk in and bellow, “KNOCK IT OFF!” He demonstrated in a menacing roar that echoed off the empty walls. The rest of the time, he said, the staff sat in the break room, playing Parcheesi or reading. Jimmy and O’Leary traded tales about the clothes room across the hall, where each night the boys stripped out of their school-issued pants, white shirts and ties and handed them over. Then, “before you go upstairs, you get searched for cigarettes,” Jimmy remembered. “You put your hands up, they touch your body, look in your underwear.” Later, he showed me the two dorm rooms, where, in his day, 70 to 80 beds were lined up side by side and end to end. If you didn’t lie quietly, he said, the aides hit you. Jimmy tried several times to run away from Mansfield. Escapees were retrieved with straitjackets and handcuffs. Once, he said, he had another resident write letters detailing his mistreatment, then snuck out and mailed them to his mother. “Stupid mother,” he said. “She brought the letters back and showed them. After she went home I got beat up more." Jimmy has no memory of attending classes at Mansfield, though O’Leary recalls taking him to school each day with the other boys. Jimmy says he ran errands and worked in the candle shop. Whatever formal education he did receive had little impact. He still cannot read or write. What Jimmy learned instead was how to survive—how to work with the system and make friends. Jimmy was tiny, crippled but “fast as getup,” said O’Leary. When he was old enough to work, Jimmy was placed at the boys’ dining hall, in the kitchen. O’Leary can still picture him, a mischievous smile on his face and “a misfitting apron down to his ankles.” He also “had a mouth on him.” Though it meant he’d get a slap every once in a while, O’Leary said, Jimmy was one of the few residents who could get away with calling staff by their first names, or even nicknames. “This place never should have existed,” Jimmy told him comfortingly. O’Leary gave Jimmy a hug. “What happened to your parents, did you ever find out?” O’Leary had asked Jimmy earlier as we wandered through Johnstone. He was stunned to learn Jimmy has always been in contact with his family. “Why’d they leave you here?” O’Leary wondered. “Don’t ask me,” said Jimmy. A FEW DAYS LATER we were seated in cushioned chairs in a conference room at the Farmington office of the Department of Mental Retardation, looking for the answer to that question. 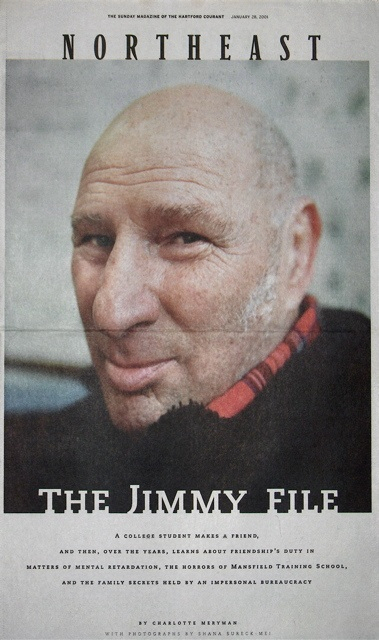 A 4-inch-thick file rested in front of Jimmy’s case manager, John Sharp. He and his supervisor carefully walked Jimmy and Mary through the permissions he needed to sign allowing me to look at its contents. Then Sharp opened the cover into Jimmy’s past—medical records, social workers’ notes, employment records, official correspondence, legal records, and sheet upon yellowing sheet of typed, translucent paper documenting his years at Mansfield. For three hours we pored over them, uncovering details Jimmy had never heard before. We discovered a stepfather his family had never spoken of, and a half-sister who died in early childhood. We found his birth records, showing he was born premature, just 4-1/2 pounds, and paralyzed on his right side. At the time, they attributed it to a fall his mother had taken. “The story I heard, my father drunk and fell, dropped me; that’s what my grandparents told me,” said Jimmy. In truth, he has cerebral palsy. There was only passing reference to Jimmy’s older brother, Edwin, and no mention of his older sister. Given up for adoption before he was born, she located her birth family as an adult. It was strange for Jimmy to hear his history recounted in the clinical and occasionally harsh words of state caseworkers. “Who wrote this stuff?” he asked at one point, his voice tinged with anger. I read from a faded report by the social worker who first examined him. He was 7 and in kindergarten, and his mother had been told that, because he couldn’t do the required work, he would not be permitted to return for first grade. The social worker found Jimmy “timid” and in need of “a great deal of love and affection.” She cautioned that while he would be eligible for a state school for the mentally retarded, that “may not be the most satisfactory placement for him.” Having few other options, his mother began the legal process of transferring care and custody to the state anyway. A year later, at the age of 8-1/2, Jimmy was committed by court order to the Training School in Mansfield. His mother was required to pay support. Under a stack of papers on the left side of his file was a set of small, black-and-white photographs marking Jimmy’s initiation to the training school. Police-style, front and profile, they captured a frail, serious child with curly black hair, in overalls and a short-sleeve, button-down shirt, an ID number clipped to his collar. In later photos, taken every few years throughout his time at Mansfield, the curly hair and overalls were gone, replaced by an institutional buzz cut and the mandatory white shirt and tie. Jimmy allowed me to study these pictures, but firmly refused to let them be published. They are a testimony to what he has endured, but they are not the way he wants the world to see him: stripped of his dignity, reduced to the sign hung around his neck: In Patient Number 3559. Even now, he refuses to wear white button-downs. Jimmy spent five months at Mansfield before he was allowed a visit to his family in Meriden. He was paroled to his mother from Christmas Eve to New Year’s, and was not signed out again until the following fall, when he spent three days home for Thanksgiving. While I read these details with pain, imagining my own 9-year-old child, Jimmy was concentrating hard. The records also tracked the many surgeries at Newington Hospital on Jimmy’s leg, hip, feet, arm, wrist and hand—at least eight hospitalizations by the time he was 20, including an eight-month stay at the age of 11. He spent several years in leg braces. He counts this now among the benefits of his time as a ward of the state. “Mom never could have afforded all those operations,” he told me. I was reading out loud, tracing his rocky road out of Mansfield in the late 1960s and early 1970s, when Jimmy turned irritably to Sharpe and wondered, “When are we going to get to the good stuff?”—the proud achievements of later years. For my part, I was discovering the turmoil that preceded my own meeting with Jimmy. In his late 20s and early 30s, he struggled to find his balance in a different kind of world. The focus at Mansfield, as in the entire field of mental retardation, was shifting away from custodial care. “Hostels,” the precursors to group homes, opened off campus, and Jimmy tried to succeed in them, but chafed under their rules, drank often and occasionally lost his temper. In 11 years, Jimmy lived in as many group homes and was returned to the training school five times, the last time just a few weeks before I met him. He even made one stab at living completely on his own, deciding, at age 34, to move to Florida. He came back a few months later, having failed to meet the state’s welfare residency requirement. Some of his escapades Jimmy remembered fondly as I read the accounts; one he challenged with a vehement, “That not true!” During those years, he also tested the waters of employment in special workshops for the developmentally delayed and job placements overseen by DMR. But, in truth, he missed Mansfield. He went back a number of times to visit old friends—staff, mainly. After a court ordered the school closed in 1984, he dictated a letter to the governor proposing the site be converted to elderly housing. It was sold instead to UConn, and to the state police for a training academy and house of correction. “They put a prison right on top of a prison,” said Jimmy disdainfully. Though the parallels escape Jimmy, I believe it was Trinity that finally allowed him to feel at home. He thrived in the contained community of a campus setting, full of familiar faces and reliable routines. After he was fired by a new food service supervisor in 1983, it took him nearly a decade to find another comfortable base, this time at Hartford Seminary, where he worked for five years emptying wastebaskets and picking up around the property. He found his third such home in the West Hartford neighborhood where he and Mary have lived for 14 years. Jimmy has worked out an informal bartering arrangement with the owners, Daksha and Prakash Thaker, sweeping and picking up trash outside the store in exchange for free coffee, soda, an occasional doughnut, or lollipops for the neighborhood kids. He told me he keeps an eye on some of the older children for their mothers, calling them if the kids are smoking or skipping school. Next door, at the West Hartford Laundromat, Jimmy saved his biggest greeting for owner George Odelius. Soft-spoken, with a kind face and easy manner, Odelius, his wife, Vina, and grown daughters have welcomed Jimmy and Mary into their family, including them in holiday gatherings and lending a hand when needed. It’s a friendship, like so many of Jimmy’s, built on moments accumulated over years—daily chats over morning coffee and afternoons shooting the breeze around the shop. Jimmy sweeps the sidewalk each day, and has taken to stopping by on Sundays, the one day Odelius isn’t there, to check on the place and straighten up. In exchange, Odelius does his dry cleaning for free. During the long months of Mary’s hospitalization, Odelius did all his laundry for free, and Jimmy called him every night to talk. During the school year, mornings also find Jimmy at nearby Whiting Lane Elementary, where he picks up litter, debris and forgotten items around the grounds in a volunteer job arranged with help from Sharp at DMR. He won’t work for pay anymore, to preserve his disability benefits. On Fridays, Jimmy joins the staff for coffee hour, and he and Mary show up occasionally for special events and performances. The few children Jimmy doesn’t know from the neighborhood he knows from school, and everywhere he goes in West Hartford, he is hailed by high-pitched hellos. I did not understand, until I set about writing this story, the true extent of Jimmy’s connections. There’s Bob Lester, who has taken Jimmy and Mary grocery shopping and to church every week for years, after answering an ad they placed in a community newsletter; and Marie Pelletier and her parents, Al and Pat Gendreau, who have included him in family gatherings for 20 years. There’s Roseann Lezak, Jimmy’s old supervisor from Hartford Seminary, who has taken Jimmy and Mary to concerts and a week’s vacation at the beach. And there are others—politicians, academics, journalists—with whom Jimmy crosses paths regularly. He pumps them for tidbits of inside information and never forgets anything he’s heard. “Telephone, telegraph, tele-Jimmy,” one friend called him. Since I’ve known him, Jimmy has kept a book full of names and numbers of everyone he has met. He supplements it now with a thick stack of business cards, which he keeps on his coffee table, bound with a rubber band. He has duplicates of many, and when an important name comes up in conversation, he pulls out an extra and hands it to me. Jimmy and Mary moved into their first-floor efficiency in the Alfred Plant Senior Housing when it was brand new; they were made eligible by Mary’s age, then 66. There was a time when Jimmy was eager to be rid of such help. Now, he appreciates it for what it is: a resource that can help him build an independent life. As a disabled person, he receives monthly Social Security and federal and state disability checks, which cover his expenses. His mother sends a little money every month for extras, like going out to eat. For health care, he has Medicaid and Medicare. In addition to Sharp and several other DMR employees, he and Mary also have the support of Connecticut Community Care Inc. and the state Office of Protection and Advocacy for Persons with Disabilities. Jimmy is a master at negotiating the system to get the benefits he and Mary need. I was delighted to watch Jimmy’s circle grow even as I tried to capture it. As he, Mary and I made our way down Summit Street onto the Trinity campus this fall, a car pulled over and a young woman jumped out. “Jimmy!” she exclaimed, throwing her arms around him, then greeting Mary with an equally exuberant hug. A Trinity sophomore, she had met Jimmy just the weekend before at the West Hartford Laundromat. A few minutes later, I witnessed his modus operandi firsthand. Along the college quad, Jimmy kept an eye out for friendly faces. “Hey!” he’d exclaim, as though to an old pal. If the greeting was returned, he’d confidently extend a hand, asking, “Who are you? Are you a freshman?” By the time we’d finished our stroll, he’d conversed with a handful of students, all of whom, I was sure, were unlikely to forget him. The biggest surprise of the past year has been a new closeness between Jimmy and his mother. His longtime stepfather, of whom he was especially fond, died in the summer of 1999, and his brother six months later. In the wake of those losses, Jimmy’s mother seems to be reaching out more—calling, visiting, and taking Jimmy and Mary out to lunch or to her home for holiday meals. When I spoke with her, she answered my questions cordially, but firmly declined to meet with me, let me look through Jimmy’s childhood photos, or be photographed for publication. I’ve never been good at forgiveness, but for Jimmy’s sake, I let it go. I could see his mother’s attentions made him happy, and wasn’t that the first thing I learned from him so long ago—that all that really matters is how we treat each other right now? Like me, perhaps, Jimmy has always had a tendency to see things in black and white, good and bad, and not accept life’s uncomfortable contradictions. But in recent years, he has grown tremendously. “She did what she had to do years ago,” he says now of his mother. “She did me the big favor. If she never put me away, I probably never would have met Mary or had the best of all worlds. Not long after this article appeared, Mary was diagnosed with terminal cancer. She died a few months later, in December 2001. 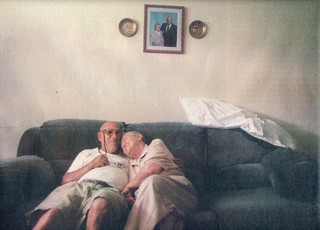 During her illness, Jimmy and Mary moved into St. Mary Home in Hartford, where she received hospice care. After her death, Jimmy moved to an elderly housing complex in West Hartford, where he lived independently for more than a decade, thanks to a network of support services, including meal preparation, cleaning, and personal and nursing care. In 2015, his own health declining, he transitioned to shared living with 24-hour supervision. He died June 16, 2018 at a group home in Bolton and is buried beside Mary in her family plot at Mt. St. Benedict Cemetery in Bloomfield. Jimmy and Mary spend most of their day together. He buys her flowers on Fridays when they go grocery shopping, and after 20 years of marriage, they still hold hands and cuddle on the couch of their West Hartford apartment. 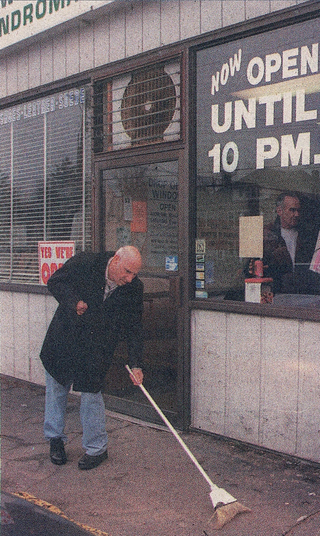 Jimmy trades odd jobs for services, like sweeping up in front of the laundromat and market across the street from his apartment. The Dairy Plus gives him free coffee. Laundromat owner George Odelius does his dry-cleaning for free.